Puyallup Kitchen Countertops | Granite & Quartz ~ Granite Top, Inc. Welcome to Granite Top, Inc. We are a full-service home granite stone company in the surrounding Puyallup, WA area as well as the Seattle, WA area. We have been in the granite and quartz business for over ten years and offer a wide variety of kitchen and bath countertops. Whether your project is large or small, we are here to help. For more information about the services we offer, check out our About Us page or Our Showroom page. Are you remodeling your kitchen and bath and unsure on where to begin? Granite Top, Inc experts are here to help. Our process is simple - we give free consultation, we then measure, fabricate and deliver! Have you been considering transforming your Puyallup kitchen into something special? Granite countertops could be the perfect solution. The first step to every kitchen countertop project is a consultation. Unlike other companies we offer FREE consultation. 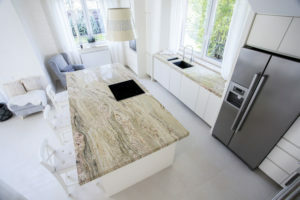 In addition to providing exceptional selection of granite kitchen counters in Puyallup, WA, we can also cut & fabricate them to your exact specifications and install them. Since granite is an extremely tough material a special equipment is necessary to shape it accurately and smoothly. We have invested heavily in our cutting machinery, which enables us to provide customized kitchen countertops that are suitable for many different shapes and sizes of a kitchen. 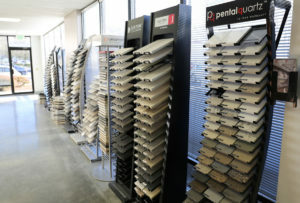 Looking for Kitchen Countertops in Puyallup? Since opening its door to Puyallup customers, Granite Top, Inc. has become the leader in the Puyallup area for quality and service. Today we continue to raise the bar when it comes to quality fabrication and installation.